On May 23, the Australian Broadcasting Corporation (ABC) and the Australian National University (ANU) will produce the television event "Stargazing Live," designed to break a skywatching record set in 2015, when 7,960 participants in Australia looked up simultaneously to observe the night-sky. Thousands of Australians are invited to help set a new Guinness World Record for the most people stargazing at multiple venues. On May 23, the Australian Broadcasting Corporation (ABC) and the Australian National University (ANU) will join forces to produce the television broadcast event "Stargazing Live." ANU hopes to break a skywatching record the university itself set back in August 2015, when 7,960 participants across 37 locations in Australia looked up simultaneously to observe the night sky. "Stargazing Live shows that science is not just about a few people in lab coats doing work, but that science is everywhere and we can all get involved," Brad Tucker, an astrophysicist from the ANU Research School of Astronomy and Astrophysics, said in a statement about the event. "The great thing about this Guinness World Records attempt is that anyone anywhere in Australia can take part, and I can't wait to break our record from three years ago," Tucker added. 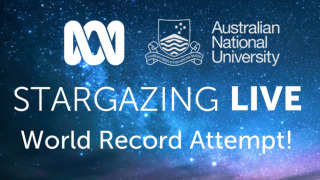 Stargazing Live will be televised from the ANU Siding Spring Observatory. The broadcast will be hosted by Julia Zemiro, a popular television presenter in Australia, and Brian Cox, who is a BBC (British Broadcasting Corp.) science communicator and a professor of particle physics at the University of Manchester in the United Kingdom. "With the future Australian space agency on the way, there's never been a better time to look skywards," said Tucker. This image combines data from four different space telescopes to create a multiwavelength view of all that remains of the oldest documented example of a supernova, called RCW 86. Stargazing parties across Australia are planned for the May 23 record attempt, according to ANU. The university will host a gathering as well, the "Canberra Star Party," which will run on the same day as part of the record attempt. An educational program is also slated to air before and after the live broadcast, produced by Tucker and the ANU Research School of Astronomy and Astrophysics. To register for the Australian National University's stargazing event, visit the school's website.